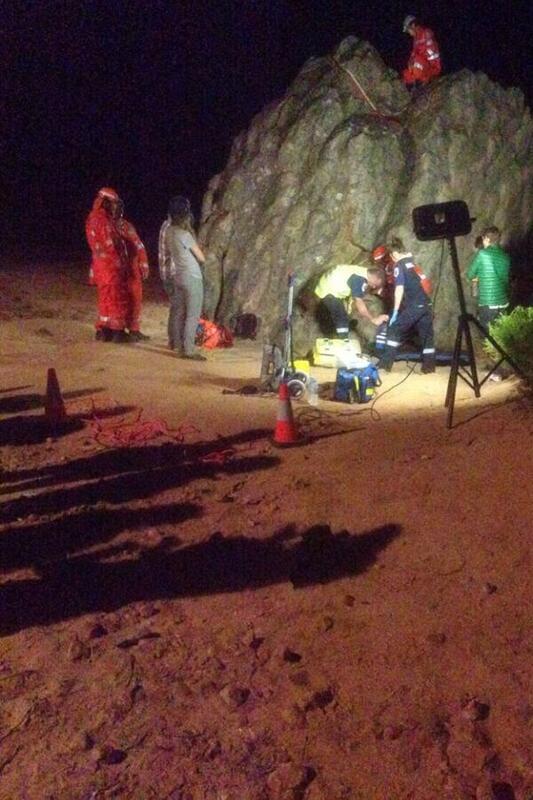 7:18am: The man who has been stuck between two massive boulders for more than eight hours at Mount Arapiles in western Victoria is believed to be suffering from a major injury to his kidneys, Caroline Zielinski reports. Victoria Police spokesman Sergeant Kris Hamilton says the 24-year-old mountain climber – who was climbing Mount Arapiles – became wedged between two large boulders during a hike about 10pm last night while he was trying to squeeze through a crevice in a location commonly know to locals at the "Squeeze Test" when he fell. Sergeant Hamilton said that although the man is conscious, he is believed to be suffering from ‘‘crush syndrome’’, which is defined as a medical condition resulting in major shock and renal failure after a crushing injury to the skeletal muscle. Emergency services, which include Victoria Police, Ambulance Victoria and SES, are attending to the man, who has been medicated throughout the night and kept warm with large heaters. SES spokeswoman Kathryn Gould said six crew members have been helping police and paramedics since midnight. Police search and rescue members are expected to be at the scene all morning and are working with local rescue group Arapiles Rescue Unit to free the man. The reports of "renal failure" may be a little circumspect. It seems somebody in the media learnt how to use Google. That said the dangers of prolonged entrapment are not to be underestimated. A pic taken from The Age link. Heard this on the radio this morning....sounds nasty, although I had thought it might be the squeeze behind Watchtower Crack. This will hopefully be easier to manage. 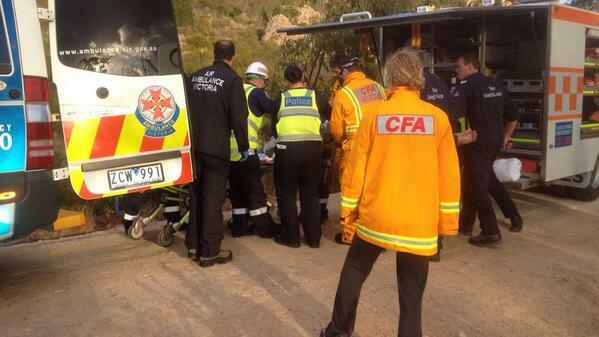 8:24am: The climber freed at Mount Arapiles after being stuck since 10pm last night in the infamous "Squeeze Test". Ambulance crew say he is suffering from hypothermia and low blood pressure and is being transferred to hospital. The ABC seems to be reporting that the poor lad "fell" in the squeeze test. Not being a fan of confined spaces I'm not certain that it is possible to fall inside the squeeze test, but the article appeared to be otherwise well written and based on factual events as opposed to drama. One thing is for sure, the poor boy would absolutely, as they say, have been freezing cold. It was cold at Arapiles even when you're clad in all your fleece and down attire, and there he was in shorts in that horrible freezing cold squeeze problem. He must have gotten panicky at some stage too which as I understand it is not helpful when you are stuck. Sending lots of get well thoughts his way. I'd be interested in how they got him out, I always worry about how I would help get a stuck person out of it. >One thing is for sure, the poor boy would absolutely, as they say, have been freezing cold. It was cold at Arapiles even when you're clad in all your fleece and down attire, and there he was in shorts in that horrible freezing cold squeeze problem. >I'd be interested in how they got him out, I always worry about how I would help get a stuck person out of it. I arrived just as he popped out so I can only tell you about the gear I helped pack up. A couple of hauling systems were used to try and elevate him in the crack as well as a long metal pole to lever him up. A lot of olive oil helped. Kieran might add some more detail after he wakes up. Probably a shot of something to help his muscles relax as well. Similar to they would do to help get a dislocated knee or shoulder back in place. Was he really attempting the squeeze problem by himself with no crowd of friends nearby? The suggestion that he had to phone for help from inside the squeeze problem sounds a bit odd. I thought the main attraction of the squeeze problem was to attempt it in front of your friends so they could cheer you on. Does anyone know of a previous rescue from this spot? I don't think 10pm is an unusual time to attempt the squeeze but I am surprised he was out there alone. >Yes, there's been a previous rescue. Gareth managed to lift the last guy out by the waistband of his pants but he was significantly slighter. I'll see if I can dig up anything. This guy takes the cake in the beknightment thread!! >This guy takes the cake in the beknightment thread!! Isn't that what Tony Abbott has recently reintroduced? >What do people think about this? It shits me that Louise would say this. That is like saying that we should ban climbing at Arapiles because people have had accidents there. I can't believe someone who is actively involved in adventure activities recommends this as a course of action given the many thousands of people have done The Squeeze Test with no drama. Nuke Arapiles into pebbles then no one will get hurt. So who gets the six pack for ajfclark being quoted in the abc site? On a side note, I guess there's a new degree of difficulty now its an oily squeeze test. How much olive oil was needed? Would have been an uncomfortable night.